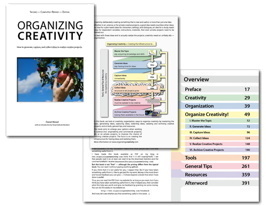 A short while after I made the second version of “Organizing Creativity” available, Dylan Damian contacted me and offered to proof-read the book. It was a nice moment — people have called me strange (or stupid) for offering something for free I worked on for months (years, actually), but I believe that when something is useful and you burn for it, you should make it available. And given that I never intended to earn money with it, why not offer it in a donationware format. If you like it, you pay what you like, if you do not like it, you should not pay for it. BTW, the paperback-color print version of the uncorrected book arrived today. 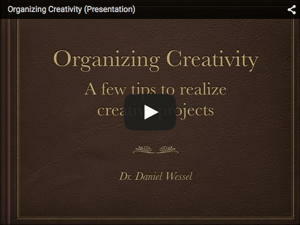 I will set up a new version (proof-read, version 2-2) and make it available in a few days. Still, it will take awhile until it is available. And I am still working on the ePub book (I have formatted it anew by changing the tables to bullet points, but the within book links will take a while). Until this is done, have fun with the corrected PDF version.